Can a cat and a large dog use the same PlexiDor? Small pets can usually open and go through a large or extra large PlexiDor. The panels swing easily and most cats and small dogs figure out how to use one half of the large or extra large door. 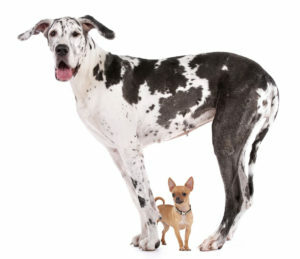 Cats are agile and find a way to get through, but if a large and small dog share the same door, make sure the lower edge of the door is low enough for the smaller dog while keeping the top high enough for the tall dog. Sometimes, the best thing is to go up a door size to accommodate both.